Even 14 year olds can have the catch of a lifetime! Great news! Big 200 pound plus Tarpon are showing up in the Caloosahatchee River. Book your charter now through end of July for the chance to reel in this sought after beauty beauty of a fish they call “Silver King”. Spring is almost here which means Tarpon are making their way back to SW Florida! Tarpon are sought after for not only for their beauty but the pure adrenaline rush you get once you hook in to one. Tarpon, of course, being only a sport fish. The SW Florida coast is a unique experience. Here in the Lee County Gulf of Mexico coast we have a shallow and slowly sloping bottom. We don’t have the large reefs of the Florida Keys or the huge drop-offs of the East Coast of Florida. What we do have is Tarpon and LOTS of them. There’s more than one reason we are called the “Tarpon Capitol of the World”. One reason is the fact that the very first tarpon was caught right here Tarpon Bay on the bay side of Sanibel Island. It was the first tarpon caught on hook and line. That started the ball rolling. When the word got out sports fishing anglers from around the globe came in droves to catch this magnificent fish and have the fight of their lives. They soon found out that the migration of the tarpon took them from off Fort Myers Beach to the north tip of our county, Lee. At the north end of Lee County is Gasparilla Island, home of Boca Grande. South of Boca Grand is the famous Boca Grande Pass. Boca Grand Pass is know for three things, deep water, Tarpon and lots of shark! The nutrient rich waters of Charlotte Harbor empty into the Gulf of Mexico through Boca Grande Pass. The waters carry what we call around here, pass crabs. These crabs are like candy to tarpon and they will pile up in layers waiting for their crunchy goodness. Capt. Matt’s great photography of bowing to the King! Boca Grande Pass actually has Rules and Regulations of fishing. Along with the ecologically responsible anglers and guides came the money hungry tournament anglers. What was once a gentleman’s sport became a “take no prisoners” kind of fishing. The boats got faster, fishing style over the top and testosterone running higher than ever. Luckily, in recent years the efforts of the responsible anglers have won out! Sure, there’s the occasional yahoo that doesn’t know the etiquette of Boca Grande. For the most part we are returning to responsible angling here in the Sanibel, Captiva and Fort Myers Beach areas. Capt. Bill and Capt. Matt practice responsible angling. This means you’ll get the best experience while fishing the fair and guilt-free way. We respect tarpon as one of the greatest species of fish in the oceans. Our Silver Kings are something to admire and we want to see them coming back to SW Florida for generations to come. They don’t call them Silver King for nothing. To be treated any less of the royal fish they are is a crime. We never gaff. Gaffing can cause a hole in the lower mouth of this fish that gulps air at the surface in order to survive. We hand hold only for photos which makes it a little more work for the captain but a bigger reward as you see this gentle giant swim off unharmed to catch another day. Anglers can spend thousands, tens of thousands or hundreds of thousands of dollars in pursuit of the famed Tarpon off Sanibel, Captiva, Fort Myers Beach, Cayo Costa and Gasparilla islands. Hiring a Tarpon guide affords you the best opportunity to catch this magnificent fish and check it off your bucket list as Thomas Edison, Henry Ford, Presidents and Billionaires have for decades. All with little effort on your part by having the best Tarpon guides Southwest Florida. Capt. Bill and Capt. Matt have put many anglers on these elusive fish and released hundreds if not thousands of the chrome beauties for numerous seasoned as well as amateur anglers. To book your Sanibel flats fishing charter please go to our BOOK NOW page and simply choose a 6 or 8 hour tarpon charter in April, May, June or July. You will not be disappointed in your hunt and catch of a lifetime. Thanks to Florida Fishing Products, Dan James Custom Rods and Fins Situational Braid for supplying us with our 2018 Tarpon Season fishing gear for a great season in SW Florida! Call direct (239) 691-1966 or go to Endless Summer Charters to make reservations for the 2018 Tarpon Season. 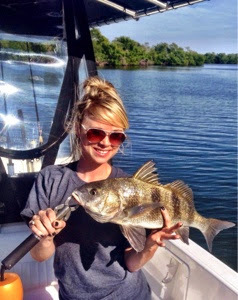 Carrie Vollmer visiting from Michigan got a chance to wrangle a few black drum and redfish today while enjoying this great weather. November is a great month for fishing. Not only is the weather great here (sunny and 73 tomorrow) but some good eating species start to return. Mackerel, pompano, sheepshead, black drum and mangrove snapper are among some of the species that are great table fare that migrate here starting in October. We hope you!ll be lucky enough to visit us in the fall when Sanibel and Fort Myers fishing is incomparable! As we move into October, like clockwork our first front of the fall season has moved in as well temps dipped into the low 70s, brrrrrr! Break out the fleece! Fishing ahead of the front things couldn’t have been more exciting. This past Saturday I had the pleasure to fish an all female team in the B103 Racks and Reels fishing tournament benefitting the American Cancer Society. We had a impressive day ahead of this front. This was a ladyfish only tourney and boy did we find some. We boated over 70 fish and weighed in our best 12 for a weight of 13.94 locking up a 3rd place spot. Thanks to the Timbers Resturant and the Sanibel Grill for their sponsorship. Our team fished nothing but artificial which provided a lot of great action…. Big trout, snook and jack crevalle but the big treat was jumping tarpon as the sun was rising. Funny what a little change in temperature will do. Please contact Angela should you want to participate in one of our local fishing tournaments! We’ll get you hooked up! The Racks & Reels fishing tournament out of Fort Myers Beach, Florida was a great event that raised money for the American Cancer Society. I was lucky enough to guide one of the winning teams and ended up with a third place finish! This all ladies tournament was the first in what we hope will be a yearly fishing event! Congrats to Ashley Kneram, Kaitlin Rae and Kelly Bonkowski for winning the $3000 purse! Way to go girls! If you would like to do a fishing tournament on my boat please contact me. I can let you know of any upcoming events you can enter and hopefully win like Team Timbers pictured above!